For other people with the same name, see Corriveau. La Corriveau's skeleton terrorising a traveller one stormy night. Illustration by Charles Walter Simpson for the Légendes du Saint-Laurent, 1926. Marie-Josephte Corriveau (1733 at Saint-Vallier, Quebec – (1763-04-18)April 18, 1763 at Quebec City), better known as "la Corriveau", is a well-known figure in Québécois folklore. She lived in New France, and was sentenced to death by a British court martial for the murder of her second husband, was hanged for it and her body hanged in chains. Her story has become a legend in Quebec, and she is the subject of many books and plays. Marie-Josephte Corriveau was born in 1733, most probably in January or February,[Note 1] and baptised on May 14, 1733, in the rural parish of Saint-Vallier in New France. She was the only surviving offspring of Joseph Corriveau, a farmer, and Françoise Bolduc. Her ten brothers and sisters all died in childhood. Corriveau married at the age of 16, on November 17, 1749, to Charles Bouchard, aged 23, also a farmer. Three children were born in this marriage: two daughters, Marie-Françoise (1752) and Marie-Angélique (1754), followed by a son, Charles (1757). Rumors (that only started after the death of her second husband) say that she murdered him, as there is no concrete record of his death. Charles Bouchard was buried on April 27, 1760, and she remarried fifteen months later, on July 20, 1761, to another farmer from Saint-Vallier, Louis Étienne Dodier. On the morning of January 27, 1763, he was found dead in his barn, with multiple head wounds. Despite an official recording of the cause of death being from kicks of horses' hooves, and a speedy burial, rumours and gossip of murder spread rapidly through the neighbourhood. Dodier was on bad terms with his father-in-law and with his wife. At the time, New France had been conquered by the British in 1760 as part of the Seven Years' War and was under the administration of the British Army. On hearing the rumours, the local British military authorities (charged with keeping order) set up an inquiry into Dodier's death. The inquiry opened in Quebec City on March 29, 1763, at the Ursulines of Quebec, charging Joseph Corriveau and his daughter Marie-Josephte, before a military tribunal made up of 12 English officers and presided over by Lieutenant Colonel Roger Morris. The case ended, on 9 April, with Joseph Corriveau being sentenced to death, for culpable homicide of his son-in-law. Marie-Josephte was found to be an accomplice to murder, and sentenced to 60 lashes and branded with the letter M on her hand. One of Joseph Corriveau's nieces, Isabelle Sylvain (who he employed as a servant), had testified but changed her story several times during the hearing; she was found guilty of perjury and given 30 lashes and branded with the letter P.
Condemned to hang, Joseph Corriveau then told his confessor, that he was no more than an accomplice to his daughter, after she had killed Dodier. At a second trial, on 15 April, Marie-Josephte testified to having killed her husband with two blows of a hatchet during his sleep, because of his ill-treatment of her. The tribunal found her guilty and sentenced her to hang, her body after to be "hanged in chains" (that is, put up for public display on a gibbet). The place of execution was Quebec, on the Buttes-à-Nepveu, near the Plains of Abraham, probably on 18 April. Her body was then taken, as directed by the sentence, to be put in chains at Pointe-Lévy, at the crossroads of Lauzon and Bienville (today Saint-Joseph Street and De l'Entente Boulevard). [Note 2] The body, in its iron gibbet, was exposed to the public view until May 25 at the earliest. Following the requests of those living nearby, an order from the military commander of the district of Quebec, James Murray, addressed to the captain of the militia of Pointe-Lévy, permitted its being taken down and buried. In 1849, the "cage" was dug up from the cemetery of the church of Saint-Joseph-de-la-Pointe-Lévy when a pit was dug. [Note 3] Soon after, the cage was stolen from the church cellar, and acquired by the American impresario P. T. Barnum and put on display as a "macabre object". After that, it was put on display at The Boston Museum. The museum slip indicated its provenance with two words: "From Quebec". Through the efforts of the Société d'histoire de Lévis, the cage was acquired from the Boston Museum and is now, part of a permanent display at Musée de la civilisation in Quebec City. The post-mortem exhibition of Corriveau's remains at a busy crossroads (a practice also in use under the French regime, and reserved in England for those found guilty of the most serious crimes);[Note 4] the repercussions in the trial; the rumour that her father would be convicted of murdering Dodier at his daughter's instigation; and the gossip which grew up around the circumstances of the death of her first husband all stirred up the popular imagination and became legends still told today in the oral tradition — increasing the number of murdered husbands to as many as seven and likening la Corriveau to a witch. The 1849 discovery of the iron cage buried in the cemetery of Saint-Joseph Parish (now the Lauzon district) served to reawaken the legends and the fantastic stories, which were amplified and used by 19th-century writers. 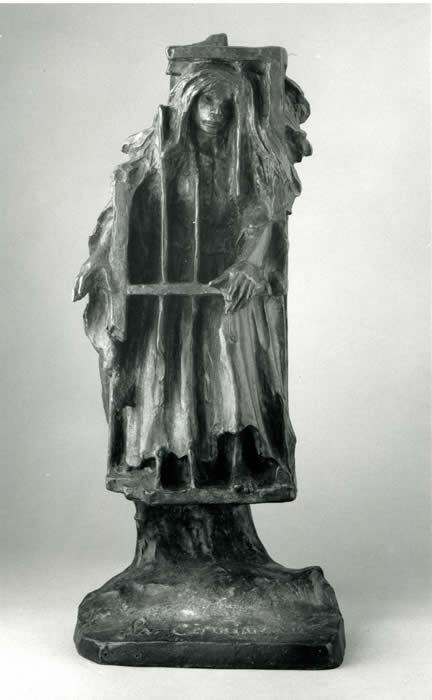 The first, in 1863, Philippe Aubert de Gaspé in Les Anciens Canadiens, has a supernatural Corriveau hanging in the Pointe-Levy cage, terrorising one night a passer-by conducting a witches' Sabbath and Will-o'-the-wisp at the Île d'Orléans. James MacPherson Le Moine (Maple Leaves, 1863) and William Kirby, following in his footsteps (The Golden Dog, 1877), made her a professional poisoner, a direct descendant of La Voisin, famous for her purported role in The Affair of the Poisons. Writers and historians such as Louis Fréchette and Pierre-Georges Roy have tried to give Corriveau's history, but without completely separating the facts from the anachronistic fantasies added in legend and novels. Caroline de Saint-Castin (right) pressing to her lips the poisoned bouquet offered by la Corriveau (left). Late 19th-century illustration by J. W. Kennedy for an American edition of The Golden Dog by William Kirby. 1885: La Cage de la Corriveau, novel by Louis Fréchette, first published in a special edition of the newspaper La Patrie, 24 February 1885; reprinted and rewritten many times, notably under the title Une Relique in the Almanach du peuple de la librairie Beauchemin, Montreal, 1913. 1966: La Corriveau, dramatic ballet choreographed by Brydon Paige, with original theme and songs by Gilles Vigneault and music by Alexander Brott. Commissioned by the Commission du Centenaire de la Confédération, the ballet was premièred by Les Grands Ballets Canadiens, with the collaboration of the Montreal Symphony Orchestra at the Salle Wilfrid-Pelletier of the Place des Arts at Montréal, 21 and 22 December 1966. 1973: Ma Corriveau, play by Victor-Lévy Beaulieu written for the public examinations of the students of the National Theatre School of Canada, premièred at the Monument-National, its Montreal base, from 3 to 6 October 1973 with a production by Michelle Rossignol, first premièred professionally at the Théâtre d'Aujourd'hui in Montreal from 19 September to 30 October 1976 in a production by André Pagé. 1978: Le Coffret de la Corriveau, fantasy story by André Carpentier [fr], translated into English in 1982. 1990: La Cage, play by Anne Hébert, translated into English in 2009. 1993 : La Corriveau, short story by the English Canadian Douglas Glover, translated into French the same year, and into Serbian in 1995. 1993: La Corriveau, play by Guy Cloutier, produced by Denise Verville and staged at the Théâtre Périscope [fr], Quebec, from 12 to 30 January 1993. It was reprised, adapted for television with the title La Corrivaux by the director Jean Salvy, with Anne Dorval in the title role, and broadcast on the Télévision Radio-Canada network in 1995. Aubert de Gaspé, Philippe (1863). Les Anciens Canadiens (in French). Québec: Desbarats et Derbishire. pp. totales =411. ISBN 0-665-28743-7. OCLC 77173288. Bonneau, Louis-Philippe (1988). Josephte Corriveau-Dodier, la Corriveau, 1733-1763 : une énigme non résolue. 15 (in French). Saint-François-de-la-Rivière-du-Sud (Quebec): Société de conservation du patrimoine de Saint-François-de-la-Rivière-du-Sud. pp. totales =231. OCLC 22506977. Fréchette, Louis-Honoré (1981). "La cage de la Corriveau" (PDF). La Patrie, special edition, 24 February 1885 (in French). Longueuil: Société historique du Marigot: 10–20. ISBN 2-920313-01-0. Archived from the original (PDF) on 13 June 2011. Fréchette, Louis-Honoré (1913). "Une relique - La Corriveau". Almanach du Peuple Beauchemin (in French). Montréal: Beauchemin: 302–307. Guilbault, Nicole (1995). Il était cent fois La Corriveau - Terre américaine (in French). Quebec: Nuit blanche. pp. totales =192. ISBN 9782921053426. OCLC 35874386. Anthology containing fifteen oral versions of the legend of la Corriveau, different literary texts inspired by the theme, and four studies. Douglas Hay (1996). Frank Murray Greenwood; Barry Wright (eds.). Civilians Tried in Military Courts: Quebec, 1759-64. Toronto: University of Toronto Press / The Osgoode Society for Canadian Legal History. pp. 114–128, 621–623. ISBN 9780802078933. OCLC 225313361. Archived from the original on 2010-12-03. Retrieved 2010-07-22. Kirby, William (1877). The Chien d'Or / The Golden Dog - A Legend of Quebec. New York and Montreal: Lovell, Adam, Wesson & Company. ISBN 0-665-07186-8. Kirby, William; Le May, Pamphile (tr.) (1884). Le Chien d'or - Légende canadienne. Feuilleton de L'Étendard (in French). Montreal. ISBN 0-665-07987-7. Lacourcière, Luc (1969). "Le destin posthume de la Corriveau". Les Cahiers des Dix (in French). Société des Dix (34): 239–271. ISSN 0575-089X. Archived from the original on 2007-09-29. Lacourcière, Luc (1973). "Présence de la Corriveau". Les Cahiers des Dix (in French). Société des Dix (38): 229–264. ISSN 0575-089X. Archived from the original on 2008-09-21. MacPherson Le Moine, James (1863). "Marie-Josephte Corriveau, A Canadian Lafarge". Maple Leaves : A Budget of Legendary, Historical, Critical, and Sporting Intelligence. 1–7. Québec: Printed, for the author, by Hunter, Rose & Co: 68–74. Greenwood, Frank Murray; Boissery, Beverley (2000). Uncertain Justice, Canadian Women and Capital Punishment 1754 - 1953. Toronto: Dundurn Press / The Osgoode Society for Canadian Legal History. pp. totales= 258. ISBN 9781550023442. OCLC 44751697. Saint-Martin, Lori (1997). "Figures de la sorcière dans l'écriture des femmes au Québec". Contre-voix : Essais de critique au féminin. Essais critiques (in French). Quebec: Nuit Blanche. pp. 165–189. ISBN 9782921053778. OCLC 38430897. ^ a b The record of the act of baptism, of May 14, 1733, indicates that she was about three months old. ^ These were all near an ancient religious site between the Saint-Joseph and Vaudreuil roads. There was a religious monument called the Monument de la Tempérance which remained in the middle of the nineteenth century, until 1885. ^ Some renown attached to the bones recovered in this dig. The writer Louis Fréchette wrote about this discovery at the age of ten. ^ Notably the 52 stories collected between 1952 and 1973 under the direction of Luc Lacourcière (Lacourcière 1973, pp. 252–253 "Archived copy". Archived from the original on 2011-06-14. Retrieved 2010-07-22. CS1 maint: Archived copy as title (link) and the 122 put together between 1975 and 1990 by the students of Nicole Guilbault (Guilbault 1995, p. 14). ^ Bonneau 1988, p. 44. ^ Aubert de Gaspé 1863, Chapter 4. ^ MacPherson Le Moine 1863. ^ Lacourcière 1973, p. 247. ^ Beaulieu 1976, p. 8. ^ Carpentier, André (1978). "Le Coffret de la Corriveau". Rue Saint-Denis : contes fantastiques (in French). Montreal: Hurtubise HMH: 75–92. ISBN 0-7758-0165-8. , reissued by André Carpentier in 1988 (Quebec Library, Montreal), translated into English in 2000 and Italian in 2004 (Worldcat). ^ Carpentier, André (Winter 1982). "The Chest of Madame Corriveau". Matrix. 17: 41–48. .
^ LeBel, Andrée (1981). La Corriveau (in French). Montreal: Libre Expression. ISBN 9782891110563. ^ Hébert, Anne (1990). La Cage, suivi de L'Île de la Demoiselle (in French). Montreal/Paris: Boréal Express / Seuil. ISBN 9782890523203. ^ Glover, Douglas (1993). "La Corriveau". 24 (4). Descant. ISSN 0382-909X. ^ Glover, Douglas (1993). "La Corriveau". Meurtres à Québec (in French). Quebec: L'Instant même: 9–24. .
^ "Curriculum Vitae of Douglas Glover". Retrieved October 21, 2009. [permanent dead link]. ^ Mativat, Daniel (1999). "La Maudite". Chacal (in French) (8). Saint-Laurent: Éditions Pierre Tisseyre. ISBN 9782890517233. Archived from the original on 2007-03-22. ^ Pariseau, Monique (2003). La Fiancée du vent - l'histoire de la Corriveau, née en Nouvelle-France et pendue sous le Régime anglais (in French). Outremont: Libre Expression. ISBN 9782764800669. ^ Latulippe, Martine; Rousseau, May (illustrator) (2003). Julie et le serment de la Corriveau. Bilbo Jeunesse (in French). Montreal: Éditions Québec Amérique. ISBN 978-2-7644-0240-5. Archived from the original on 2010-04-13. Retrieved 2010-07-22. ^ Tremblay, Odile (December 4, 2003). "Le curé et la pendue". Le Devoir (in French). Retrieved April 12, 2010. Dion, Sylvie (2003). "La légendification du fait divers : le cas de Marie-Josephte Corriveau, la pendue encagée". Canadart (in French). XI: 11–24. ISSN 0104-6268. Dion, Sylvie (in Portuguese), Fantasmas femininos e imaginários coletivos-os casos de Marie-Josephte Corriveau e Maria Degolada, in Bernd (dir.) (2008). Imaginários coletivos e mobilidades (trans)culturals. Porto Alegre: Nova Prova. pp. 145–160. .
Wikimedia Commons has media related to La Corriveau. Documents concernant la Corriveau, Bibliothèque et Archives nationales du Québec, Centre d'archives de Québec, Collection Centre d'archives de Québec, P1000,S3,D435. 128-page collection of research notes on la Corriveau (p. 1), typed transcription of the article by James MacPherson Le Moine, Marie-Josephte Corriveau, A Canadian Lafarge, from 1863 (pp. 2–11), a newspaper clipping entitled Le procès de la Corriveau, dated 28 February 1939 (p. 12) and a copy of the proceedings of the Corriveau case (typist's copy and photostat of the manuscript) (pp. 13–128) of the originals preserved by the Imperial War Museum in London. Gema Leblanc, La Corriveau, 1989. Story about the legend of la Corriveau, recounted in 1989 by Gema Leblanc, inhabitant of Quebec, to Isabelle-Sophie Dufour. Published in Nicole Guilbault (ed. ), Contes et sortilèges des quatre coins du Québec, Documentor/Cégep François-Xavier-Garneau, Quebec, 1991. José Bourassa, La Corriveau, 1989. Story about the legend of la Corriveau, recoiunted in 1989 by José Bourassa, inhabitant of Charny, Quebec, born in Drummondville, to Dany Parizé. Published in Nicole Guilbault (ed. ), Contes et sortilèges des quatre coins du Québec, Documentor/Cégep François-Xavier-Garneau, Quebec, 1991. This page was last edited on 10 April 2019, at 19:21 (UTC).